2 1/2" Plastic Egg. Shipped unassembled. Imprint Area Approx. 1"W X 1/2"H for 1 color print, 7/8"W X 1/2"H for full color print. Production Time 5 business days. Rush orders (Add $0.20 ea): 2 work days and only for either 1-color, 1-side and full color 1-side prints. Virtual proofs will add 2 business days. Setup Charge $35.00 per color/location. 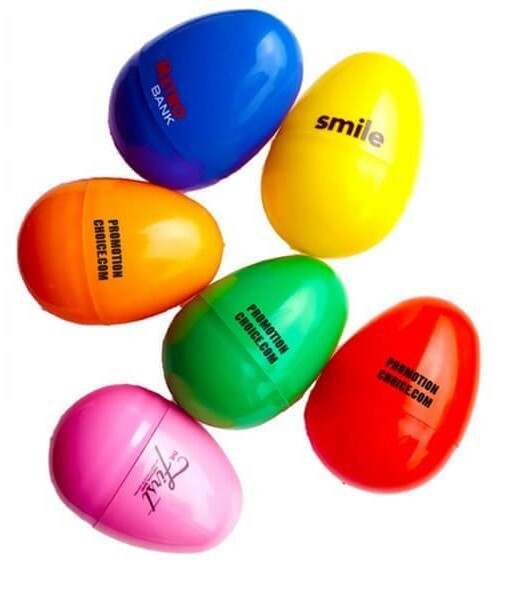 These eggs are very well made and the logo printed looked great! I would definitely order them again. Very nice eggs for the price. Solid plastic, definitely better quality than your dollar store eggs. I did not get them imprinted, and the only reason it's not 5 stars was that the estimated shipping date was two days from when I ordered it, and I wasn't updated until I asked on the expected delivery date and was then told that it would arrive the next day.